Hoohak pipe at Tour of Qatar. No, this is not doping. No, this is not confiscated equipment from one of the teams in the Tour of Qatar. Nobody is under arrest, thrown in some squalid jail or incurring the wrath of anti-drug priestess Anne Gripper. No worries here in the land of Q. Yes, at first glance it could be some sort of weird arabian centrifuge or illegal doping contraption. The uninformed and overly suspicious may wrongly assume the worst if they found this gadget in a rider’s room. However, we can all rest easy and the Tour of Qatar is still doping free. 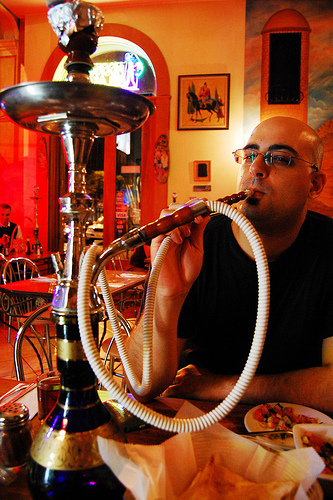 This is simply the classic hookah pipe or shisha and no cause for UCI-quality alarm. The sharing of the hookah pipe in cycling-mad Qatar, the Italy of the Middle East, is just a custom among cycling fans here. No need to panic or jump to conclusions. « Tour of Qatar. Mystery, intrigue, camels that refuse to carry Mavic wheels.